After more than a week of implementations, it is finally there !! 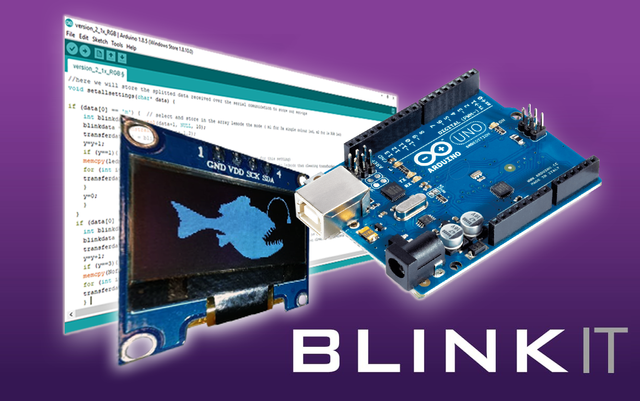 Our new implementation that brings a higher user experience with Arduino integration in the Blinkit project. Now, not only the notifications are received over the blinking of a LED, but now, it is also possible to receive another visual feedback thanks to the new implementation of an OLED display which will display the state of your arduino board (standby state and notification state). Due to the limited SRAM memory in Arduino boards (in my case Arduino UNO) i had at the beginning a usage of 133% of SRAM which logically would not let me compile and upload the sketch to an Arduino Uno board. I had to work on using my internal memory ("ROM") in order to move some parts of code that are sent to SRAM during compile in order to lower SRAM usage. After a rework of my code, my SRAM usage dropped from 133% to 76% !!! Let's dive into the integration and code !! Files can also be found in my Github repo dedicated to Blinkit integration. How to increase user experience with some added features ? Following the previous release where i had lot of fun in slimming down the code and making it more modular in order to implement new things, we decided that it was time to enhance user experience while using Arduino boards with Blinkit. What could be better than an OLED screen displaying every state of the board ?? So now whether the board is in standby mode waiting for triggers or whether it is receiving notifications, the display will let you know what exactly is happening. Blinkit is a notification software that can be used to give to regular and widely available devices a Steem purpose. Blinkit can look for new Steem account Upvotes and Followers, and it can notify on new Posts made by a user. More devices will be added in the near future. Current release has been tested only on an Arduino UNO board. Other boards like Mega and Nano should be supported (for Nano different PWM pins should be selected, for Mega nothing to change) but have not been tested yet. Users interested in using this new feature with other boards could submit a test contribution and let us know the result of their test. Code structure has not been changed but have inlined the display code to work simultaneously with it and have made major adjustments in the handling of constant data that was initially stored in the SRAM during the compile phase. Hereafter i will show and explain only the parts of the code where changements have been made. After havign installed the Adafruit Libraries in the right place, in order to use them in your code, you must include them in your code at the beginning. Afterwards you should initiate the display reset in order to be able to initialiaze the display later in the setup. For future implementations with other display size i created a variable that is the LCD_HEIGHT since the I2C OLED displays can come with different height (mine is 64px) so for different size (i.e. 32px) just change the value in there and also change the initiated display size in the Library file .h. The above part of code are the Blinkit .bmp logo converted into a byte array in order to be displayed later on the screen. As you can see in order to save SRAM usage and since these bytes are constant (the logo will never change), thus i declared them into the PROGMEM (the internal memory of Arduino) and not into the SRAM. After having declared all the new things, it is time to initialize the display and let it start interacting with Blinkit through Arduino. The initialization part will display the Blinkit splashscreen on the display, during the boot up of Arduino, as the Blinkit logo will fill the buffer during the compiling because it has been inlined in the Library file. As you can see the structure of this part has not really changed. We have inlined the code related to the display which will let us know when there is incoming new data. The structure of this part has not really changed. We have inlined the code related to the display which will display a nice sliding pattern of the Blinkit text and the blinkit logo while doing the fading pattern with the led, as shown in the below gif. above is part of the inlined code. As per above example, the display will show in a nice way which effect is being triggered. afterwards, based on the notification received the display will show which notification has been received. Wiring diagram for both ledmodes and for the OLED display can be found in Blinkit main repo or in my repo. Technical support is available, if you may encounter a problem, or if you want to know if your device is supported or will be supported in the near future. Do you have a question, or suggestion about the integration of Arduino in Blinkit ? Feel free to contact me on Discord (electronicsworld#0829) or leave a comment below. Hello, electronicsworld, upvoted and resteemed! Reply with "STOP" to end this madness. Starting next week @artturtle will be upvoting only those posts that contain one of the following tags: art, music, fashion, video, book(s), artopium, handmade, originalworks, artzone, photography, painting(s), utopian-io, openmic. Want @ArtTurtle to follow you too and upvote and resteem your art, music, fashion, video and books? Find out how by visitng @artturtle and reading the latest report. Thank you @arabsteem !! much appreciated !! Greetings @electronicsworld! Your post was chosen at random and was resteemed because you are one of our followers. Enjoy your free resteem! By upvoting this notification, you're supporting @Shareables. Thank you for your contribution, a great update to the project. Well done @electronicsworld! You successfully guessed the match result.